I last left you with the Tri-Lakes Visitor Guide and local demographics. Next up is a Sunset Book, Terrariums & Miniature Gardens, 1973. People might not know it, but I have somewhat of a green thumb . . . one of these days I’ll wash the paint off, but I’m hoping it will eventually wear off. Oh, and I also like plants, and have a number of them that thrive in our house. This book has interesting projects in it, and while I am sure there are newer books, before I buy any of them, I need to read this one. The link I provided leads you to get used copies of it for only a penny . . . and $4 shipping. Here’s an example of the content . . . They have a large section on plants, and various types of suggested arrangements. The next tall-thin booklet you see is a guide to the Blue Ridge Parkway. Except it’s mostly hotels listings and attractions. Not worth showing as there is now more available online. After that, the next thin book, the blue one . . .
One of the few regrets I have about the 26 years we lived in Michigan is that we never did what we had said we would do . . . travel the shoreline and hit all of the lighthouses before moving away. HOWEVER . . . we still plan on doing it one of these years, and then I’ll do a book like this, only with better photos. 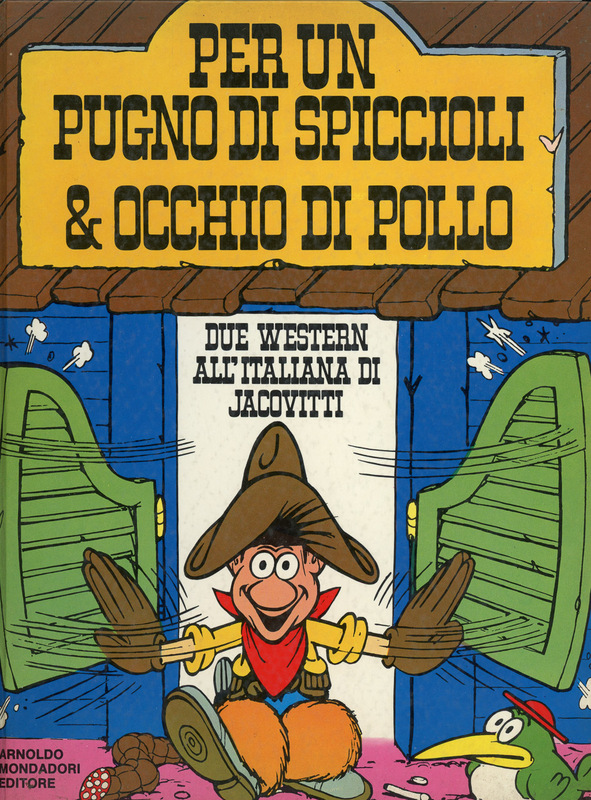 The book contains two western stories, the first being “Per un Pugno di Spiccioli”, 1967, translates as “For a Fistful of Change”, an obvious send-up of “Fistful of Dollars”, 1964. The other is “Occhio di Pollo”, 1957, which translates as “Eye of Chicken”, or maybe “Chicken Eye”. I have no idea what movie this one references. The inside cover page gives the dates and a hint at the content. The action inside is over-the-top, and that includes the dialogue (it’s still funny to me, but then I read Italian). 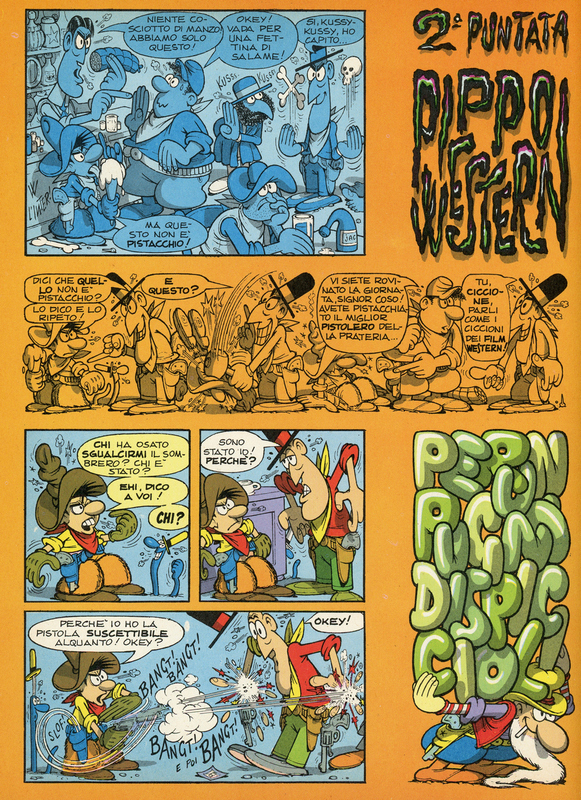 They speak of the “gun culture” in the US, but I grew up with these cartoons, with Tex Willer, and other action heroes who had one thing in common; a facility with guns, and a propensity to use them. My love for guns was firmly entrenched long before I came to the US. 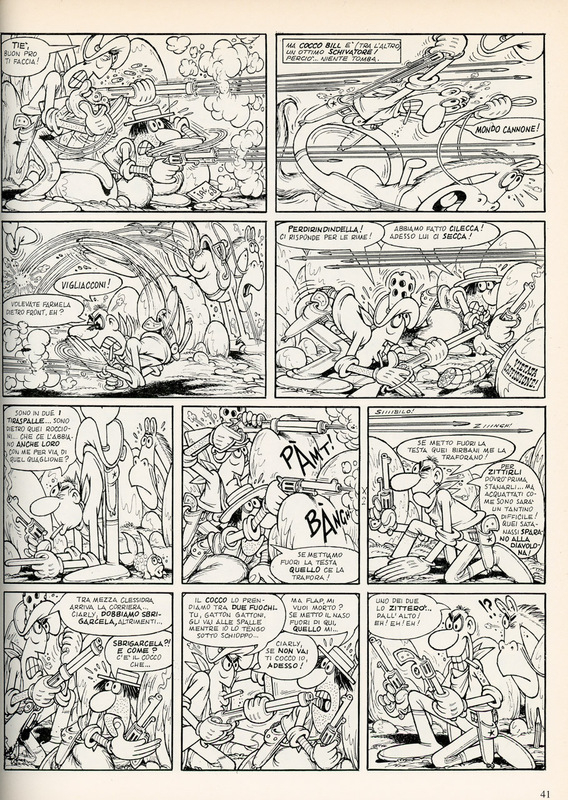 The two pages above are from “Per un Pugno di Spiccioli”, and the following pages are from “Occhio di Pollo”. Yes, the blond guy is none other than Boffalo Bill. 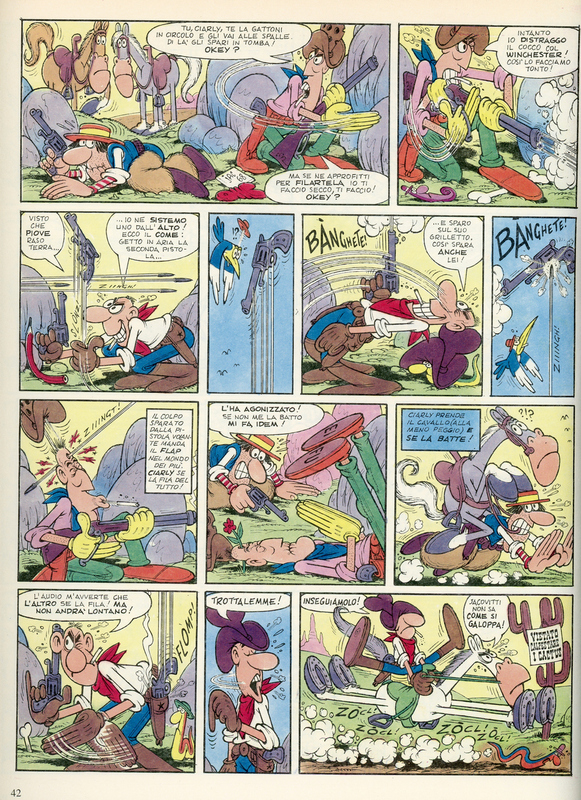 I wonder who Jacovitti used as an inspiration for the character. And here’s a treat for my readers; the full “Occhio di Pollo” as a YouTube slideshow. I liked those comics . 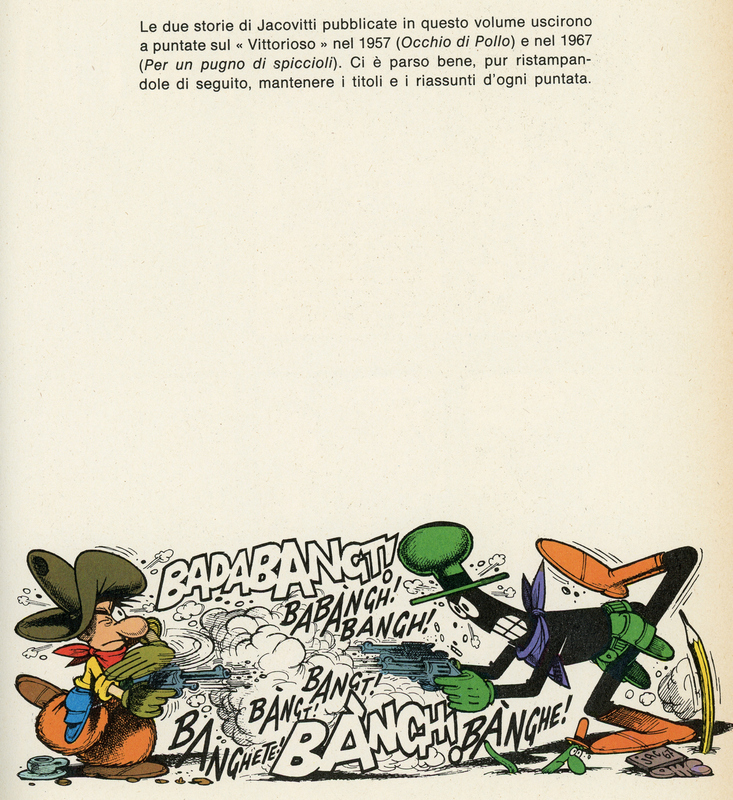 . . but my favorite Jacovitti character is Cocco Bill. 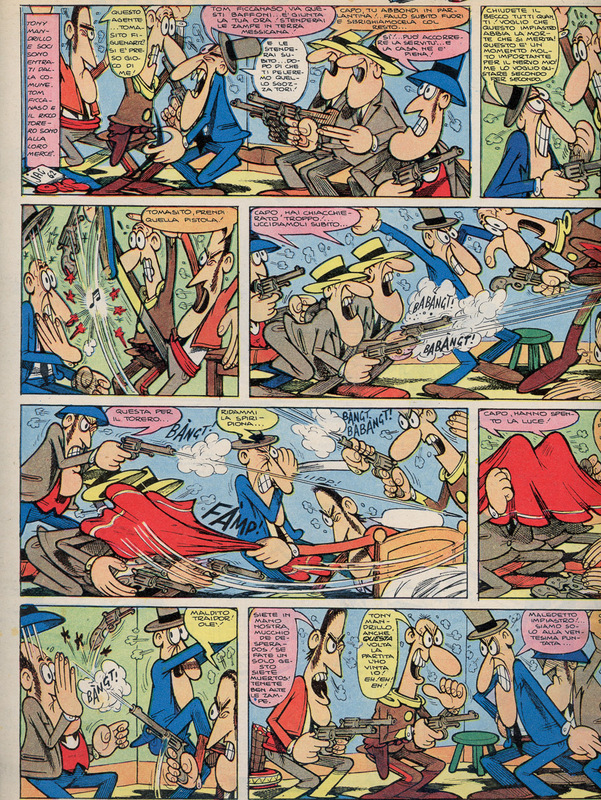 The next book, “Trotta, Trotta … Cocco Bill!“, 1998, is a collection of Jacovitti’s personal favorite Cocco Bill cartoons. A fast-shooting, camomilla-drinking, Trottalemme-riding cowboy and all-around good guy who always does what is right – and that mostly means shooting up the bad guys – was, and still is, an inspiration for me. Here’s a few pages just to get the flavor of the action and drawing style. As unique as the drawing style is, the writing is something else . . . hard to describe, and near impossible to translate, but trust me . . . still funny. Next to the book one can see a couple of beat-up folders . 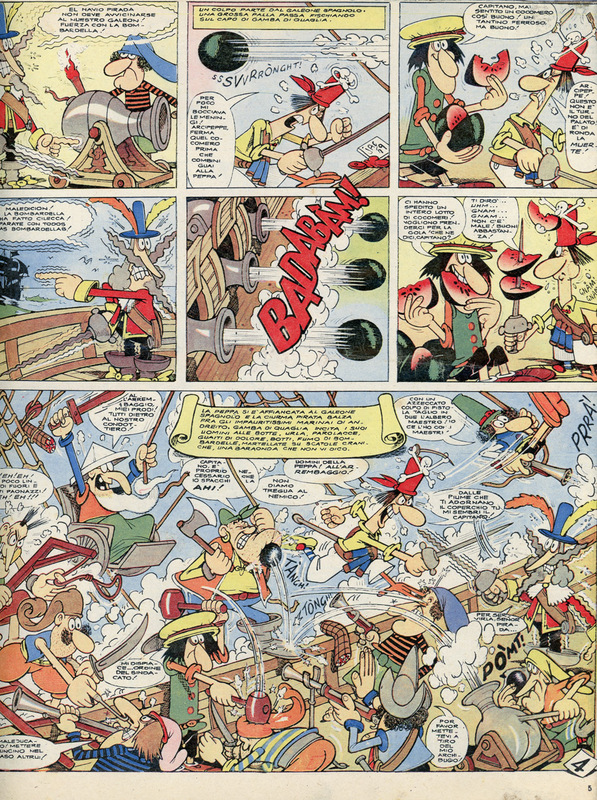 . . those are folders containing pages from newspapers where Jacovitti’s cartoons appeared. You see, he not only drew westerns, but also detective stories . . .
. . . and even pirates stories . . . I don’t remember right now, and it’s too late to call my mother, but I’m thinking those were clipped and saved in the folders by my uncle Marino. He succumbed to cancer a number of years ago, and these passed to me. I could be wrong; they could be from a friend of the family. Regardless, I have them now. Not sure what will happen to them once I’m gone. They will probably be discarded by people who will not recognize in them the same joy and spirit that I did. Those are the two big blue and slightly ‘fuzzy’ folders. Next to them one can see the brown spine of another folder. There are actually two folders there, one being hidden. They are the original printouts (the first one printed on an Epson Dot-Matrix printer) of the first two stories I wrote. Both were written for my wife on her birthday (on different years). The first one is on this blog, HERE. The second one never made it in the blog, but can be read HERE. If you happen to read them, remember they are over 20 years old, and my first attempts at writing. Not making excuses for them, but it could be I’m a little better now. The last book on this shelf is “The Great International Airplane Book“, by Jerry Mander, George Dippel, Howard Gossage, from 1971. 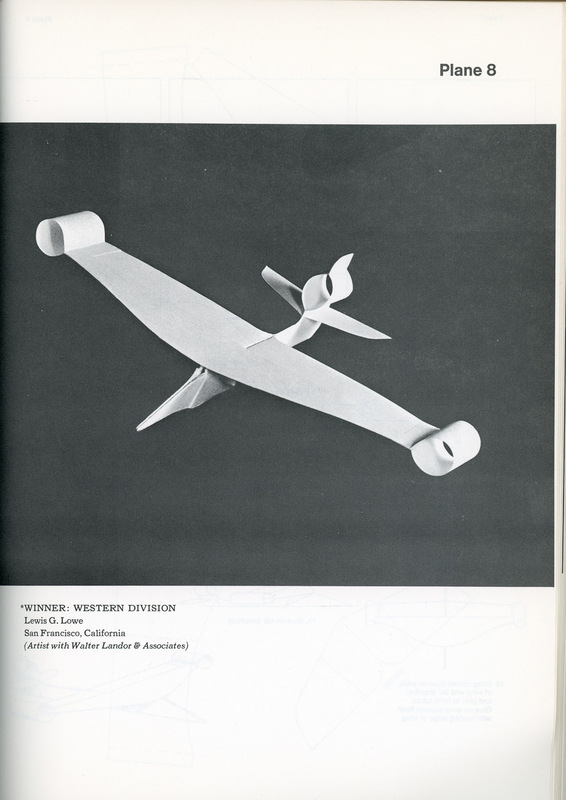 The book was the result of a 1967 paper airplane competition sponsored by Scientific American. They would repeat it in 2008, and you can read the article HERE. 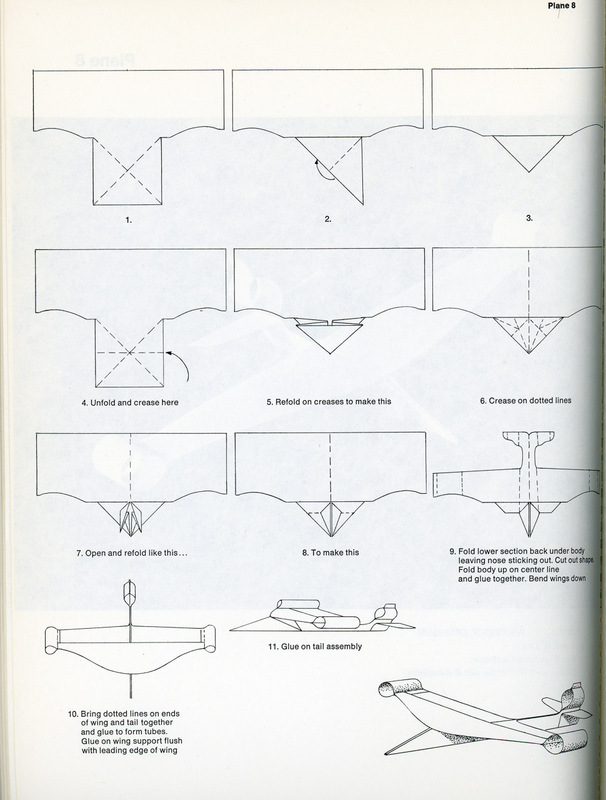 That too resulted in a book: The New Millennium Paper Airplane Book, which I don’t own. It has all the plans for building the planes that competed. Here’s an example. OK, I admit . 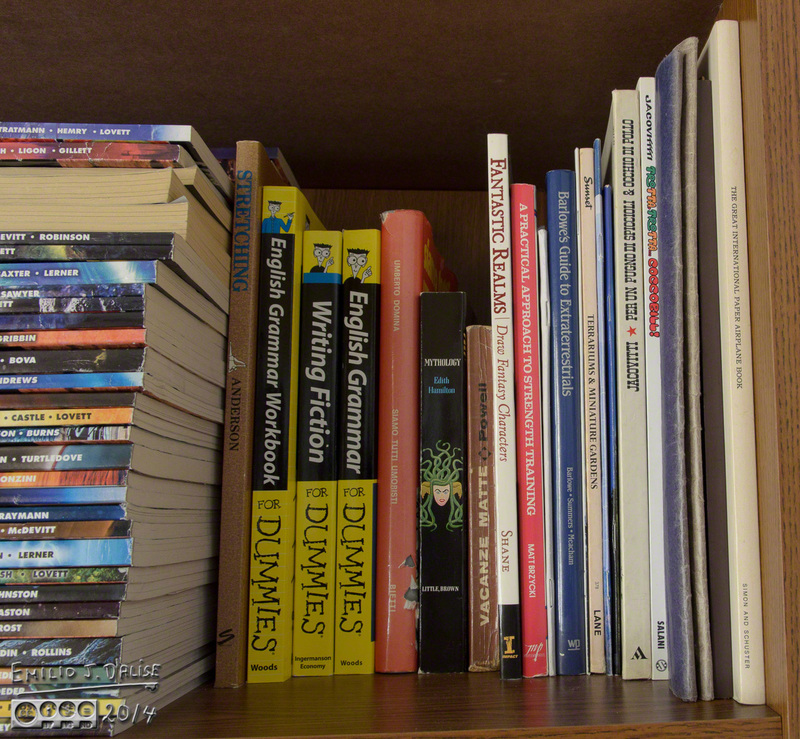 . . this was a long post.
. . . but, look at it like this; we finally got through the first shelf. Thank you for reading this Fifth installment, and I hope you join me for the remainder of the rivetting progression through my library. Lots of good stuff to come, if I do say so myself (I usually have to, as few others ever speak so of me). There is one model I have made since I was a kid, and I’ve never seen it anywhere else. Perhaps I will do a post on it. Thanks . . . hope it met your expectations. More good stuff! Too bad you didn’t travel the Michigan coast, I’ve seen many photos and there are some beautiful spots. There is a Lake Ontario coast road that we traveled years ago and it was memorable. Back then it was easier traveling in Canada but I suppose if you’re prepared it would still be an exciting trip, especially this time of year. 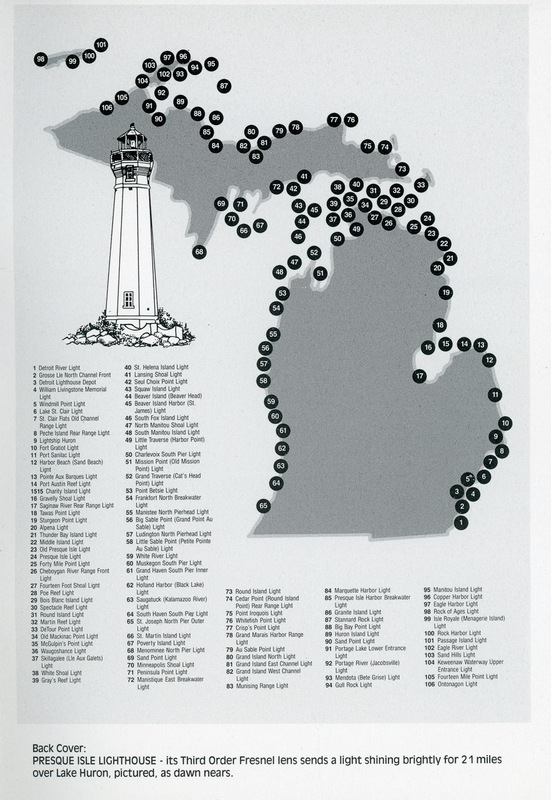 We traveled many individual areas of both the lower and upper peninsula, but never with the intent of hitting all the lighthouses. Within a few years we will probably do that. Yes, he kind of does if you are referencing popular characterization of Custer. Then again he does resemble an early Buffalo Bill in dress and hair. I was somewhat surprised at the original date of publication; in my mind I had those comics as more modern. Terrariums strike me as being claustrophobic, I feel for the plants stuck inside. That is one heck of a lot of lighthouses! Probably not as many round the coast of England. Actually I have no idea how many there are/were, but they look to be every few yards on that map. 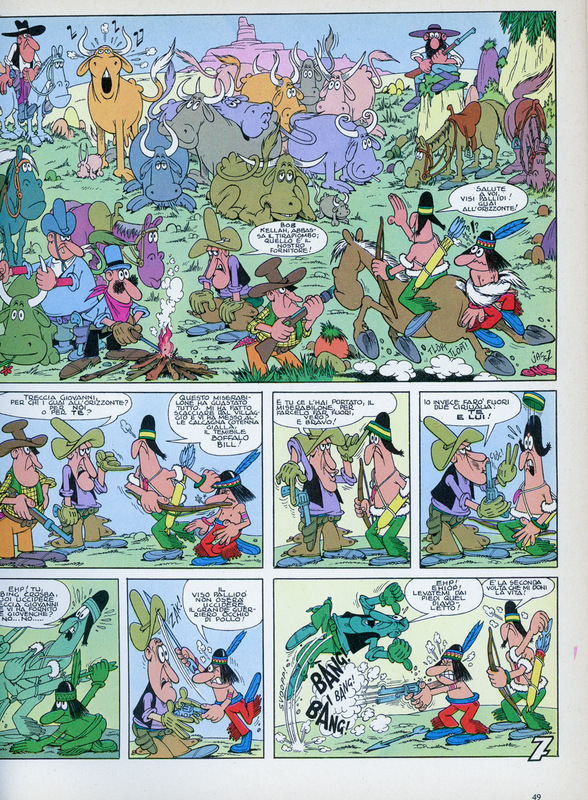 One of the first foreign language books I bought in Italian had cartoons. Something about descending to hell with Dante. It was probably early 70s. I graduated from ‘planes (which flew) to origami. 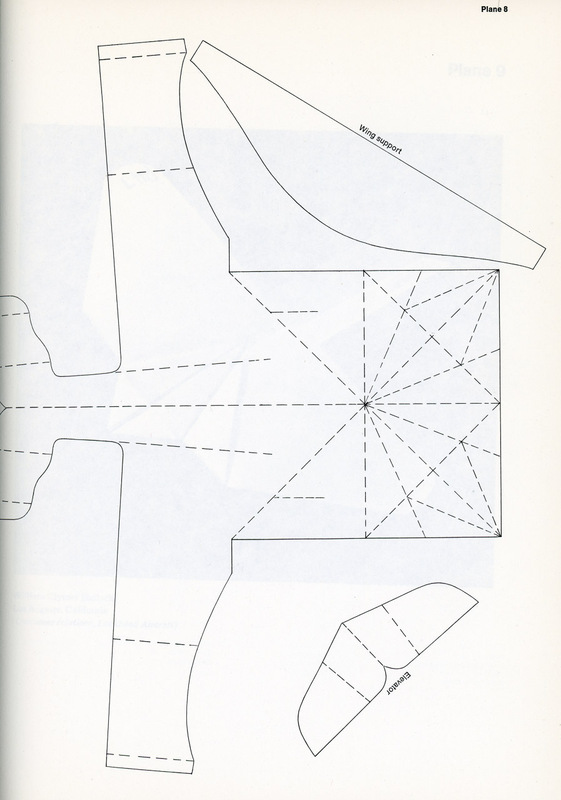 Loved the precision of folding paper. Made 100 paper cranes a few years back for someone with cancer. A Singapore friend suggested it, so I thought, it can’t do any harm. Not many people signed up for it. Some said they couldn’t make the birds, but really, it was easy. Took no time at all. We discussed it afterwards, and hoped our good wishes had given her a few extra years. Who knows? Another way to look at it is that they have their own little world, designed just for them, and free from original sin. The Great Lakes do have a lot of lighthouses . . . Lots of history, too. I still subscribe to daily and weekly comics, but I’ve not read actual comics books after I came to the US. I used to have a book on origami, but don’t like the taste of it in food . . . didn’t know people made animals from it. I’ve always had a fascination with lighthouses and the idea of you taking a trip around Michigan and posting all those wonderful photos has already begun my anticipation for them. 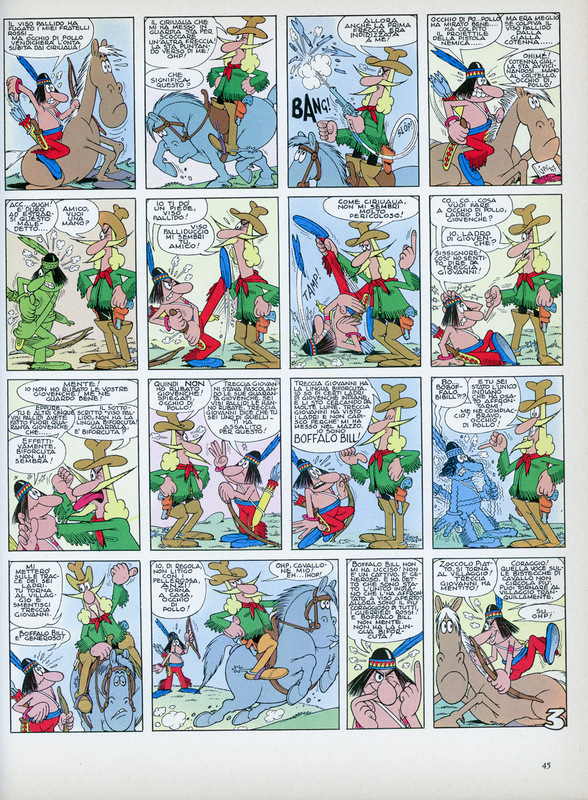 As for the Jacovitti comics, I never realized it until now how much detail he was able to put into each ‘frame’. I especially like the larger ones that burst at the seams with action. A great trip down memory lane and one that mother will surely enjoy as well. And between you and mother, paper planes abounded in our household. I even recall a memory of papa doing that . . . wow, now that’s an image that has not surfaced in ages . . .
Yeah, there’s always something new to find when re-reading those comics. Mom and I watched the “Occhio di Pollo” video . . . much more of a treat than just reading it! It is . . . sort of . . . it works for that cartoon but for Cocco Bill, the animation and voices detract from the cadence and imagination I have of how that character sounds and acts. For me, the animation often doesn’t represent the same thing as I read in the comics.
. . . even worst in English . . .